But after spending a few weeks travelling around the country, I have gotten to know the most typical Ecuadorian dishes and found a few that I really liked. To help you discover the country’s unknown cuisine, I have put together this guide for you. Read up on the most delicious food and enjoy your stay here! Locro de papa is without doubt my favourite Ecuadorian dish. 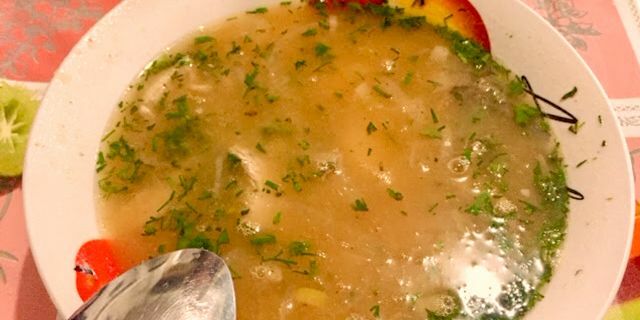 It is a soup made of potatoes and cheese and it keeps you warm during those cold evenings in Quito. Most of the time, it comes together with avocado and maybe egg, although the exact preparation varies from one city and even from one restaurant to another. Cilantro is a common ingredient, too. Sometimes, the soup is already assembled. At other times, you will receive a plate of garnishes and get to decide yourself what you want to add. Most of the time, the soup is vegetarian, but it might also come with pieces of meat. Ask before if you’re vegetarian. A good place to try locro de papa is at the Central market in Quito. It is not advertised on any menus, but if you ask around the food stalls, everyone can serve it to you. Ecuador is famous for its potatoes, so it’s no surprise that this ingredient shows up in the top two dishes to try in Ecuador. My second favourite food in the country is called llapingachos. They are small patties made of potatoes and cheese. Can you imagine a better combination? To be honest, the llapingachos I had didn’t look very appetizing. It was a bit mushy, but the taste was one of the best I ever had in the country, right after locro de papa. These small potato patties come with a variety of seasonings and are usually either served as a side dish or as a snack at street food stalls. If you get the chance to try them, I highly recommend you take it. Talking about street food. 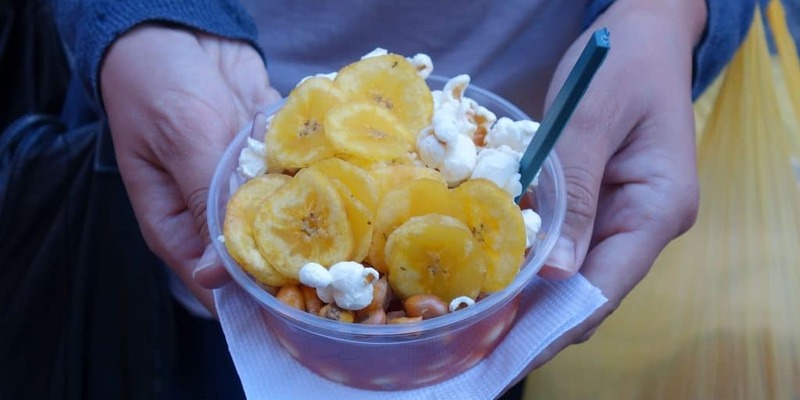 Cevichochos is a popular dish in the Andes that I found at a street food cart in Quito. The main ingredient are chochos, white beans that are native to the Andes. Just like in ceviche, the beans are usually marinated in lime juice and served with onion and tomato. Besides that, they come with corn and banana chips and various other possible ingredients, like cilantro, that are optional. The combination is absolutely delicious! The chocho beans are supposed to be high in protein, so they are a good source of energy if you get tired of exploring Ecuadorian cities and need to recover. Trucha (Spanish for trout) is the most commonly eaten fish in the Andes. When we went on a trip to the area surrounding Cuenca, we came past many trout farms and eventually stopped at a restaurant to eat fish. 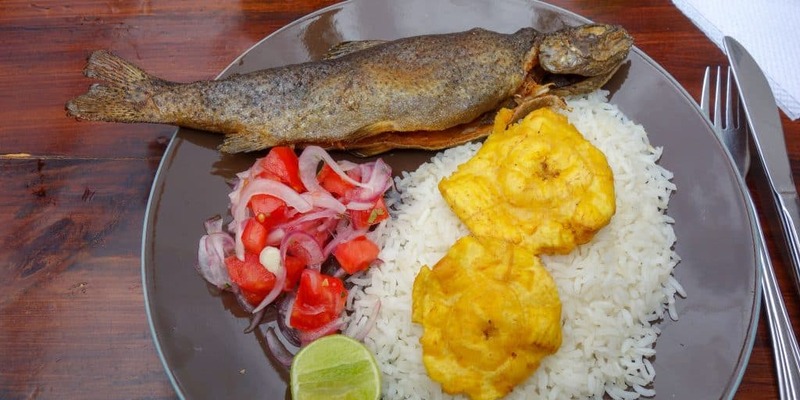 Trucha is usually eaten fried and served with rice, french fries, fried yuca or other vegetables. Talking about fish. In the coastal region, where fish is part of many dishes, encebollado is a typical dish that you can find at many restaurants. This fish stew is often made from albacore tuna but depending on what is available, people use all sorts of fish. You can have it for lunch and dinner, or, if you feel hungover, even for breakfast. It is supposed to magically cure all hangovers. The soup includes onions and fresh tomatoes, and often fresh herbs like coriander. Depending on where you are, you can order it with various sides such as plantains or bread. A good place to try encebollado, if you travel to Ecuador, is Guayaquil. Bolons come in multiple varieties all over Ecuador and are the perfect snack to eat on a long bus ride. Bolons de verde are made from green plantains but I have also found a variety made with mashed potatoes. People cook the plantains, mash them and then turn them into balls and fry them. You can find the bolons with a variety of fillings, ranging from cheese to fried meat. They also have different sizes, from a ping pong ball to a grapefruit. A big bolon de verde, served with a fresh fruit shake, is the perfect breakfast dish. With fish as fresh, the ceviche has to be good. Everyone thinks that ceviche is Peru’s national dish. But ceviche exists in many countries along South America’s Pacific Coast, including Ecuador. And eating ceviche in Ecuador is different from eating it in Peru. 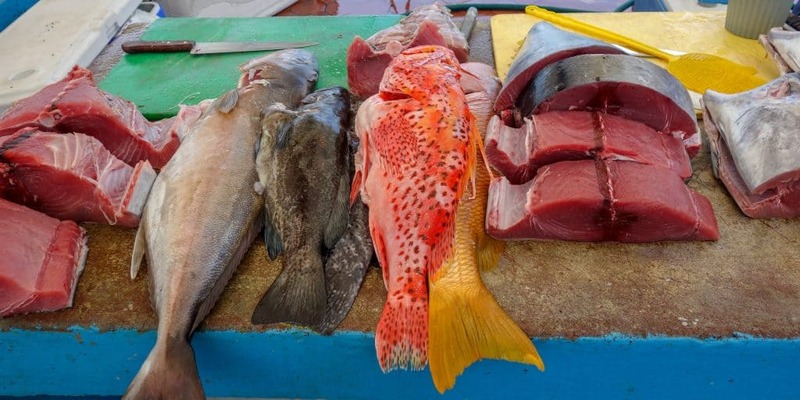 Both countries use similar kinds of seafood. Shrimp, for example, is very popular both in Ecuador as well as in Peru. They also use the same kind of lime to marinate the seafood and they add the same kind of onion. But in Ecuador, people often serve ceviche with the juice that is was cooked in, which makes for more of a brothy dish than in Peru. And, unlike in Peru, people do not add chilies directly into the sauce. Instead, they serve hot sauce on the side so you can decide yourself which level of spiciness you prefer. Oh, and besides hot sauce, some people also add ketchup or mustard to their ceviche. To each their own, I guess. 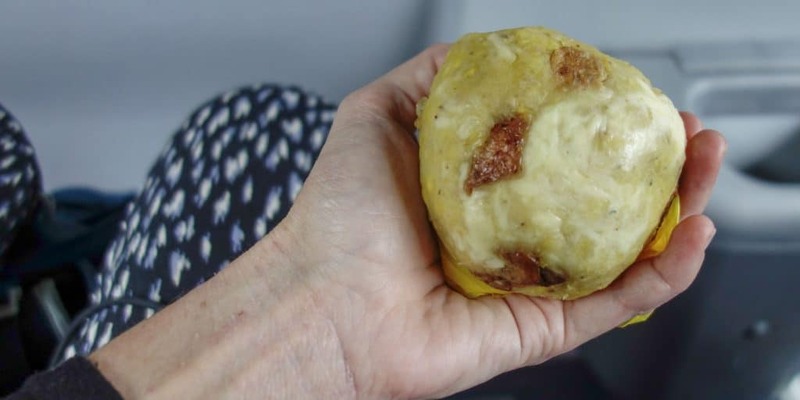 I already mentioned bolon de verde as a typical plantain dish, but if you go to Ecuador, you will find this fruit served in many different ways. 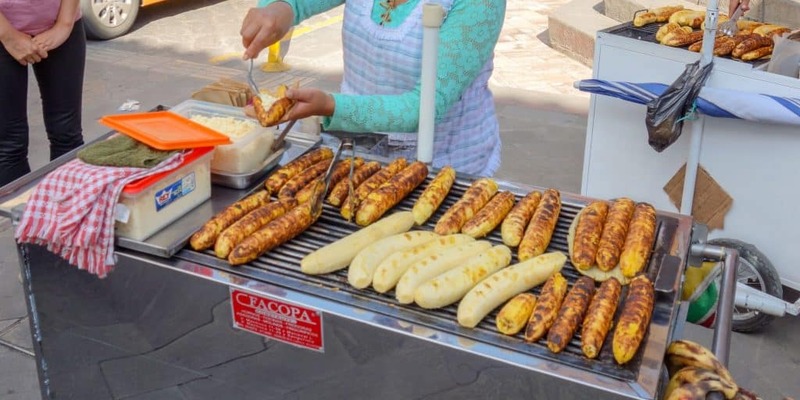 Look around the street food carts and you might see people offering what looks like grilled bananas. Don’t be fooled, those are not the bananas you know from home. Instead, they are plantains and there are multiple ways of serving them, all of which involve cheese. Some vendors might slice them open and fill them with cheese. Others sprinkle cheese on top and some just serve it on top of a slice of cheese. Whatever you end up with, I assure you that it’s going to be delicious. Now that I have introduced you to a few typical dishes of Ecuador, you need to get to know its drinks. My favourite one, by far, is called Colada Morada. Locals traditionally drink this for the Day of the Deceased in November, but I managed to find it in the Galapagos Islands at a different time of the year. Purple corn flour forms the base of this drink and gives it its great colour. That’s also the reason why it reminded me of api, a similar drink that you can find in Bolivia. Besides corn flour, the drink contains all kinds of berries and spices, such as cinammon, cloves and anis. The best way to enjoy colada morada is while it’s still hot. Drink it with a side of empanadas or bread. 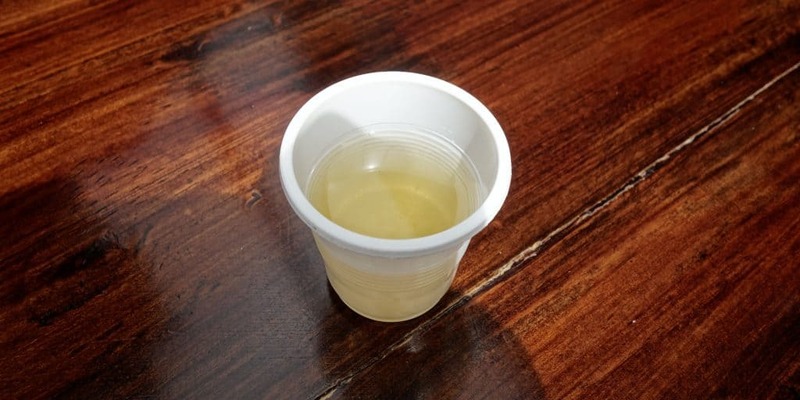 Canelazo is perhaps Ecuador’s most well-known drink, mainly because it is easily available in Quito and because it contains alcohol. The alcohol comes from aguardiente, a sugar cane alcohol that you can find in Ecuador. But the typical taste comes from boiling water with cinnamon and sugar, and the alcohol isn’t added until the end. If you stay in Quito, you will be able to go out during the day wearing only a t-shirt. But as soon as the sun sets, the cold creeps in and I found myself curling up under a blanket many evenings. Or you could go out to La Ronda and warm yourself up with a drink of canelazo. So many different kinds of fruit to choose from! You cannot leave Ecuador without trying some o their amazing fruit shakes. While staying in Ecuador, I had a batido every single morning. Most of the time I went for mora, the Andean blackberry. It’s a funny fruit that looks like raspberries but tastes like blackberries. The shake is simply amazing! 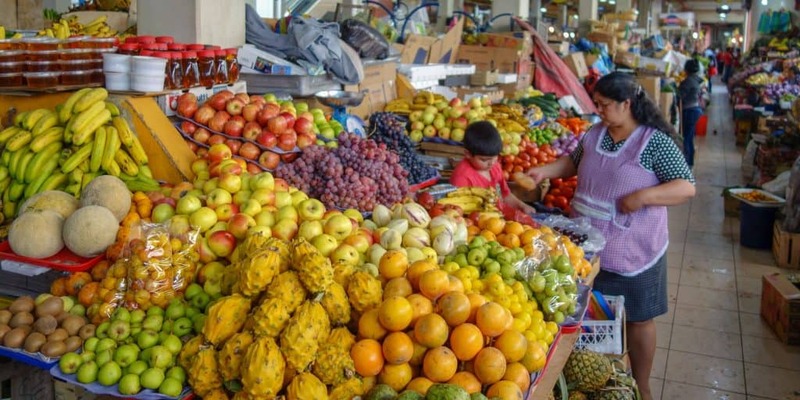 Another juice or shake that you have to try while in Ecuador is tomate de arbol. Don’t confuse this with tomatoes! This fruit neither looks nor tastes anything like regular tomatoes. It’s a delicious juice that I found myself ordering many times. 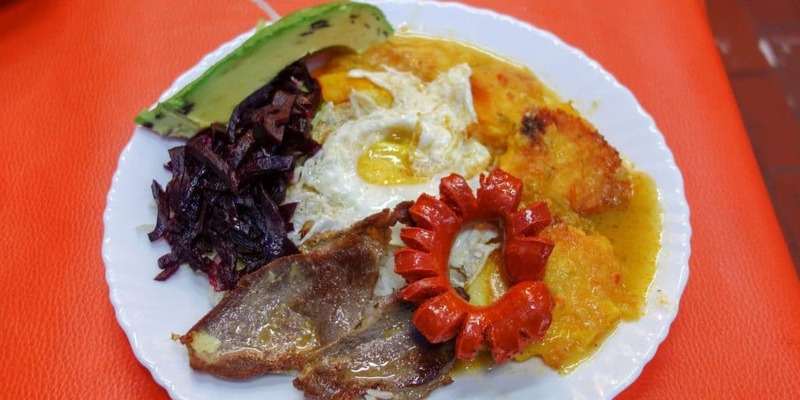 I hope I could help you with this summary of the most amazing Ecuadorian dishes and that you’ll get the chance to try some of them while staying in this country. You will not be able to find them everywhere, as each region has their own typical food. I never went to the Amazon region so I couldn’t include much from there. But if you went and know some typical dishes, please let me know as I’m curious about them. If you’re planning on travelling to Galapagos, check out my budget guide. Also, read up on what to do in Guayaquil, in Quito and in Ecuador in general.